Bottle: Kronenbourg 1664 has the look of a classic European lager. It’s housed in a green bottle that’s been embossed with the numbers ‘1664’, with a blue beer label across the top of the bottle which proudly states that this is a beer of the international variety – definitely not a domestic one. Blurb on the bottle: Kronenbourg’s striking blue label proudly states ‘Première Bière Français’, which, in case you’ve forgotten your beginners French lessons from school, means it’s the premiere beer from France. It also says, ‘brassee avec savoir-faire depuis 1664’, which translates to ‘brewed with expertise since 1664’. The 330ml bottle of Kronenbourg 1664 that we’ll be reviewing today is imported directly from France – because it says so on the bottle itself. From experience, people have often mistaken Kronenbourg for a German beer. Perhaps that’s because the ‘bourg’ part of its name sounds more German than French to some people, or perhaps it’s because this beer is commonly found in Germany? 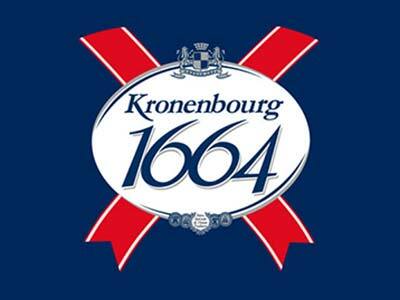 Whatever the reason for the confusion, the Kronenbourg 1664 beer label couldn’t be clearer about its French origins. Tastes like: A superior brew to most mass-produced European lagers. Unlike those other beers – Carlsberg, Beck’s, etc – you can actually taste the Kronenbourg 1664’s hops. It’s not a hoppy beer by any means, but it is rather refreshing to be able to taste anything of note (I had a hell of a time trying to review Heineken recently). How do you describe that beer’s overly familiar taste and character? Kronenbourg 1664 is far more complex. It’s a rather sweet beer, crisp and light with just a hint of graininess. It tastes less malty than a Heineken, and I find it’s slightly hoppy aroma is more palatable. Unsurprisingly, Kronenbourg 1664 pours a clear golden lager colour with a white head, just in case you were wondering. Is it the best beer ever? I ask the same question with every beer I review. No, Kronenbourg 1664 definitely isn’t the greatest beer on the planet – but neither is it the worst. In fact, I really quite enjoyed drinking it. Kronenbourg 1664 reminded me of my time living in London, where I’d often drink it at the pub because it was a heck of a lot better than drinking Carling, or any of that Fosters garbage from Australia. I had some very fun nights drinking Kronenbourg at my local. These days, of course, I’m far more interested in enjoying a quality craft beer or two than I am in drinking half a dozen pints of Kronenbourg. But the fact remains that this isn’t a bad beer at all.